What enables D&D Machinery to meet customer’s needs is its equipment. 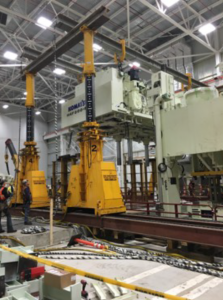 For years, D&D Machinery has been ahead of industry trends with its expanding list of equipment. As a result, D&D Machinery is able to meet customer expectations and keep costs low by purchasing the best, most efficient equipment on the market. D&D Machinery has the necessary equipment readily available at our facility eliminating the need of scheduling equipment through rental companies. Hilman Track-sporter with 200,000 lb. capacity makes internal moves a snap with limited room to operate. You can rest easy knowing that D&D Machinery will handle your project-and put your replica omega world in motion-with quality customer service and exceptional equipment every time-guaranteed.